A recent article on a forum based in the Russian city of Yaroslavl attracted my attention. It talks about a time capsule that was sealed in 1960 to be opened 50 years later during the 1,000th birthday of the city. It’s unclear if it was ever buried as intended or just stored at the museum but in any case it was opened last week. 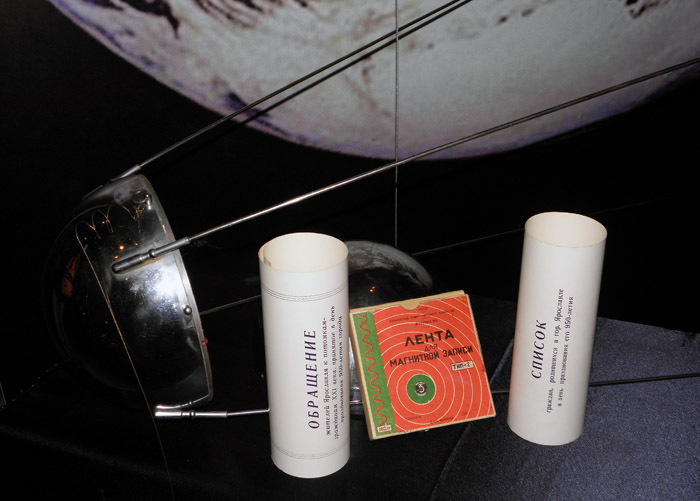 The capsule was shaped like the Sputnik – the first Soviet artificial satellite launched 3 years before the event. Inside there was a letter to the “citizens of the 21st century” from the honorary Yaroslavlians, another letter from the young pioneers, a reel of tape (the red flat box for those of you who don’t know what a reel-to-reel player is) and a list of children born on the day of the 950th anniversary of the city. The letter is truly a classic of the socialist genre, and I will translate it for your enjoyment. Greetings our dear descendants, citizens of the twenty first century! 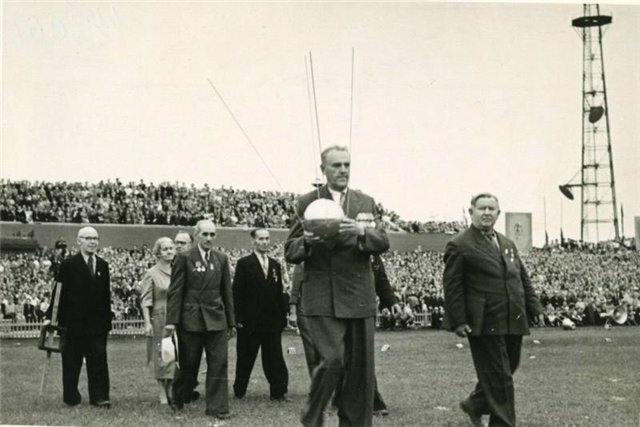 We salute you, happy inhabitants of the communist land, from a far away, but beautiful 1960. When you, our children, grandchildren, and great-grandchildren, gather to celebrate 1,000th anniversary of the city of Yaroslavl, think of us, those who lived during the era of the building of the communist society and who fought for its triumph. We don’t want to obscure the fact that we lived and worked under hard conditions. The socialism was developing and strengthening in many countries in Europe and Asia. At the same time, there was still capitalism on Earth, whose supporters did everything to derail our efforts to build a happy life. All progressive and honest people on Earth were steadfast in their struggle against capitalism for progress and justice, for happiness for themselves and their children. We, the Yaroslavlians, together with the the entire 200 million-strong Soviet people, fought for the bright future for all the humanity, under the leadership of the trusted Lenin’s Party of Communists. We fought for your future, dear descendants. Our life was filled with glorious deeds and although our labor was modest, we are proud of out achievements. 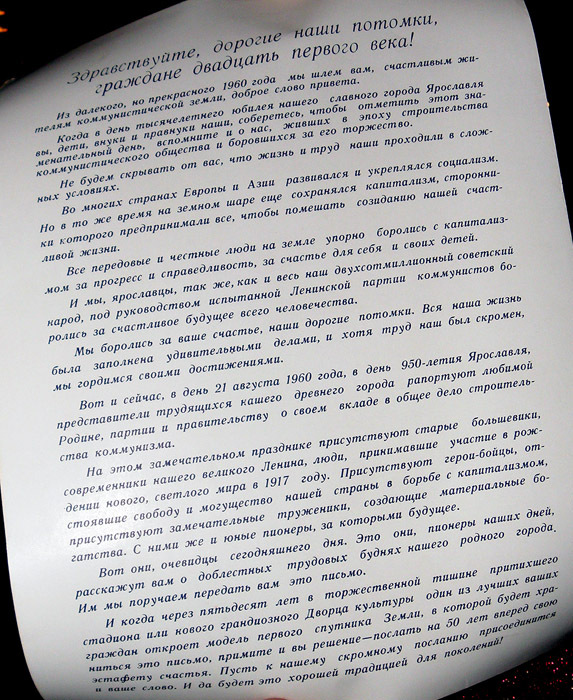 On this day, August 21, 1960, the 950th anniversary of Yaroslavl, the representatives of the working class of our ancient city are reporting to our beloved Motherland, Communist Party and the Government about our contribution to the common cause of building the communism. We celebrate this wonderful holiday in the presence of old Bolsheviks, contemporaries of Great Lenin, people who participated in the creation of the new, bright world in 1917. Also with us are the heroic fighters, who saved our freedom and the might of our country in the struggle with capitalism; the hard workers, who are creating our material wealth; the young pioneers, who are our future. They are here to witness the present, so the can tell you about our city’s valiant achievements. We are entrusting them to pass this letter on to you. 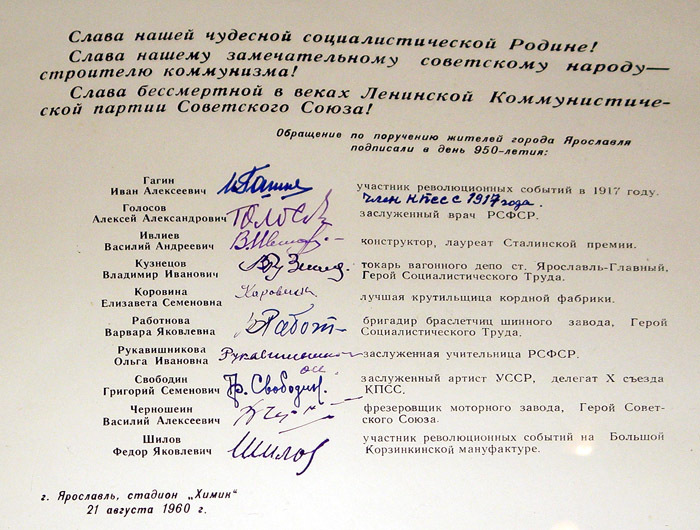 And when fifty years from now, in the solemn silence of a stadium, or some new grandiose venue, one of your most outstanding citizens will open this model of the Sputnik, containing this letter, you can decide to pass the this happy relay 50 years to the future. Add your own words to our modest message. And let it become a good tradition for generations to come. Long live our great socialist Motherland! Long live glorious Soviet People – builders of communism! Long live immortal for centuries Lenin’s Communist Party of the Soviet Union! Gagin I.A. – participant of the events of 1917 (handwritten “member of the Communist Party since 1917”). Goloskov A.A. – an honorary doctor of the Russian Federation. Ivilev V.A. – engineer, laureate of the Stalin’s prize. Kuznetsov V.I. – machinist, Hero of the Socialist Labor. Korovina E.S. – best employee of the fiber factory. Rabotnova V.Y. – a crew chief at the Tire Factory, Hero of the Socialist Labor. Rukavishnikova O.I. – an honorary teacher of the Russian Federation. Svobodin G.S. 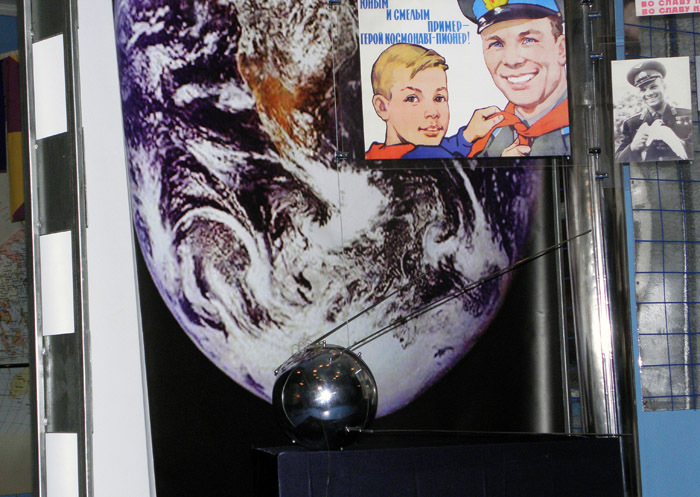 – an honorary actor of the Russian Federation, a delegate to the 10th Congress of the Communist Party. Chernoshein V.A. – machinist, Hero of the Soviet Union. Shilov F.Y – a participant of the revolutionary events.